The one-year chart of the EUR/USD depicts a general downward trend, punctuated with steep “blips.” Every couple of months or so, it seems traders are temporarily jarred loose from their mindset of Euro bearishness, and find an excuse to bid up the common currency. 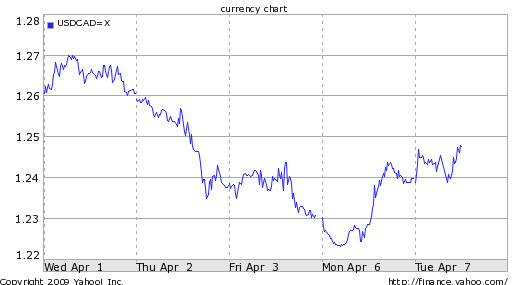 Invariably, the Euro then resumes its downward course a few weeks later. This is a huge problem for the EU, where the banking sector represents a comparatively important component of the economy.. “At the end of 2007, the stock of outstanding bank loans to the private sector amounted to around 145 percent of gross domestic product, compared to 63 percent in the United States.” This is belied by newspaper headlines that maintain the banking crisis is most severe in the US. In nominal terms, this might be true, but in relative terms, the EU is in much worse shape. 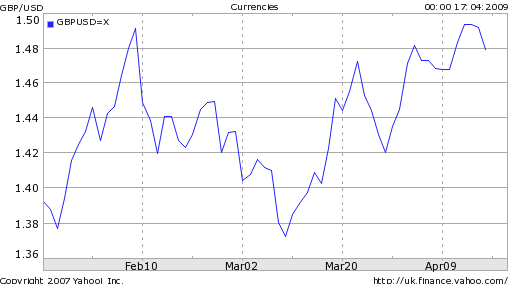 Given that exchange rates are all relative, it is worth paying attention to this phenomenon. The ECB is doing all that it can to help the situation, but many analysts and even some of the Bank’s own members remain critical. “The ambiguity of the ECB’s stance is not helping [the Euro,” offered one analyst. The ECB’s next meeting is scheduled for May 7, when economists predict the benchmark lending rate will be lowered to 1%. This will appease some investors, but not all. The head of Germany’s IFO organization, for instance, has urged the ECB to slash rates down to .25%. As ECB President Jean Claude Trichet has pointed out, lower rates will not automatically stimulate the economy: “Owing in particular to the very low rate on our deposit facility of 0.25 percent, this difference in policy rates doesn’t translate into equivalent differences in money market rates.” In fact, money market rates have largely converged across the EU and US, despite the divergence in short-term rates, vindicating Trichet. More important, then is the ECB’s non-monetary initiatives. To quote Trichet again, “Comparing only the levels of policy rates without consideration of the resulting market rates and other economic variables is looking at just one part of a far broader canvas.” The Economist recently published an excellent comparison of the various Central Banks’ responses to the credit crisis. While some have embraced their newfound prominence, other Central Banks have shied from the spotlight, insisting that their mandates are limited to inflation targeting. The ECB probably falls into this category, as it has thus far stood on the sidelines – for better or worse- as its counterparts have turned on the printing presses and flooded their respective credit markets with liquidity. 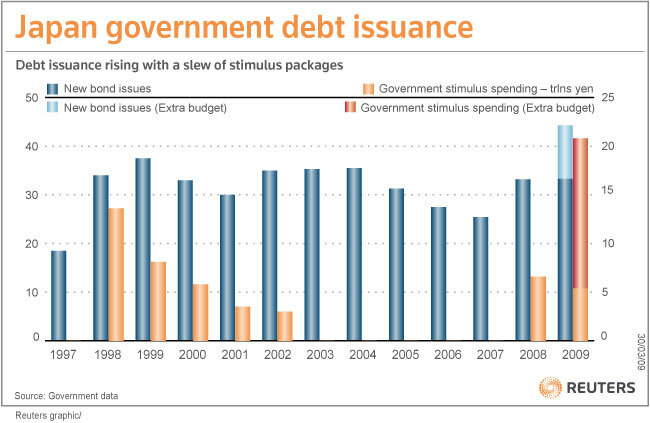 [Chart courtesy of The Economist]. The government and the Central Bank are working in tandem to relieve the situation, but there isn’t much optimism surrounding their efforts. The Minister of Finance recently announced an (attempted) expansion of Thailand’s own version of an economic stimulus plan, to $40 Billion. Funding will be provided for “investment projects in a wide range of industries such as logistics, agriculture and energy. The Bank of Thailand recently slashes rates to 1.25%, tying a record low that was set in 2003. However, “The decision to cut the rate by a quarter percentage point to 1.25 percent came as more than 40,000 protesters seeking to oust the government were massed in the capital Bangkok.” The political unrest in Thailand is old news at this point. It began over a year ago when then-Prime Minister Thaksin Shinawatra was ousted in a military coup. Since then, there have been an unending series of protests and counter-protests aimed at keeping him out or bringing him back. Basically, no one is happy with the current situation, but still there are no signs of political change. The Prime Minister has refused requests to resign, and Thaksin remains in exile outside the country. The political uncertainty isn’t really weighing on the Baht, but one analyst warns this could change: “The baht is likely to underperform in the near term due to political tensions, which have prevented the government from undertaking aggressive fiscal stimulus.” In other words, while tourism has been impacted by the protests, the biggest problem is that the government is being hamstrung in its efforts to forge a strong response to the economic crisis. Everyone has heard the cliche that currency markets are the most viable because there’s no such thing as a bear market; a decline in one currency must necessarily be offset by a rise in at least one other currency. This truism has taken on a new significance in the context of the credit crisis, where sell-offs in virtually every other asset class has sent investors scrambling in search of yield. Despite even the current rally in stocks and commodities, forex volume is surging. Equity traders are also starting to pay attention to forex. The Dollar’s recent volatility has effected significant changes in corporate profitability. 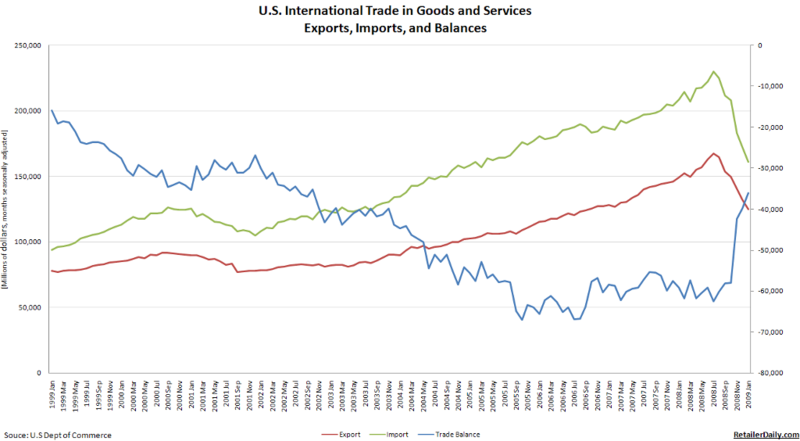 For companies that are export-oriented and/or are net buyers of commodities, the strong Dollar has provided a windfall. One analyst added, “Travel and leisure companies will also benefit from the weak dollar as this means that travel is now more affordable for foreigners.” If and when the Dollar recovers, companies that do business overseas are poised to reap the benefit. 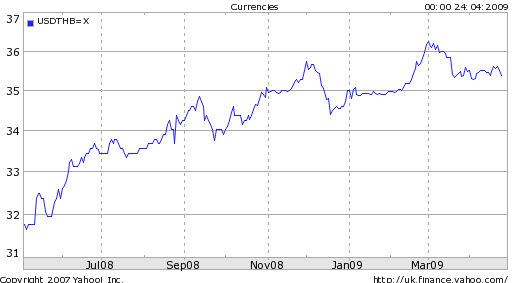 For novice forex traders, the most important decision involves choosing a trading approach; “The type of forex trader you are will determine how frequently you trade, the type of currency pairs you choose to trade, the charts you use, and even the strategies that you employ to make money on the markets.” Generally speaking, day traders churn their portfolios daily, and hence stick to the most volatile currency pairs. Swing traders typically hold positions from one day to several weeks, and rely on a combination of technical and fundamental analysis. As part of a new series, the Forex Blog will begin interviewing other financial columnists/bloggers. The following represents an interview with Karl Denninger of The Market Ticker. There was tremendous speculation surrounding today’s release of the US Treasury’s semi-annual report to Congress on exchange rates. Considering that Treasury Secretary Geithner accused China unequivocally of currency manipulation during his confirmation hearing in January, it would seem that an official condemnation was inevitable. On the other hand, there are signs that China’s economic stimulus plan has begun to trickle down to the bedrock of the economy. The Chinese money supply expanded by a record 25.5% in March, as a result of a six-fold increase in lending. Today’s release of GDP figures revealed that “By March the economy was gaining more speed, with the year-on-year increase in industrial production rising to 8.3% from an average of 3.8% in the previous two months. Retail sales were 16% higher in real terms than a year ago, and fixed investment has soared by 30%.” In short, it looks like the increase in investment and government spending will at least partially offset the projected 10% decrease in 2009 exports. [Chart below via The Economist]. Ironically, an improvement in corporate profitability would further drive risk-taking and would thus have the effect of weakening the Dollar. One would think that an improved economic outlook would strengthen the Dollar. In actuality, financial and psychological factors continue to predominate in financial markets, and investors are looking for an excuse to dump the Dollar in favor of higher-yielding alternatives. Only two months ago, the Wall Street Journal published an article under the headline “Slowdown hits Emerging Markets.” Buttressed with economic data and testimony from economists, the piece underscored the notion that “The global downdraft is hitting the world’s emerging economies with a speed and ferocity few imagined possible.” On Monday, the same newspaper published an article entitled “Emerging Markets Go on a Tear,” exploring how emerging markets have outperformed in 2009. That these stories are built around opposing themes is not surprising, but given that they were published only two months apart, it seems impossible that they could both be meaningful. A deeper analysis, however, reveals some powerful insights, namely that investors seem to be flocking back to emerging markets despite poor fundamentals. It’s difficult to pinpoint the start of the rally, but it accelerated in earnest in early March for no apparent reason other than investors arbitrarily decided to collectively increase risk-taking. This seems like a classic case of ‘making one’s own reality,’ given that the economic picture continues to deteriorate, and “positive” developments were limited to an increase in government intervention and stimulus plans. But, perception is everything in financial markets, and if investors collectively decide they want a rally, then a rally will indeed obtain. In the case of emerging markets, the rally has certainly surpassed all expectations. “A Morgan Stanley index tracking emerging-market stocks is up 12% in dollar terms. By contrast, its index following stocks in developed markets outside the U.S. and Canada is down 9%.” Meanwhile, “The extra yield investors demand to own developing nation debt instead of U.S. Treasuries narrowed 10 basis points, or 0.1 percentage point, to 5.68 percentage points. The concern, however, is that this rally is a product of financial and technical factors, and is not underlied by macroeconomic fundamentals. Exports and confidence have tumbled at a record pace, such that “J.P. Morgan forecasts at least 11 emerging economies — among them South Korea, Taiwan, Russia, Turkey, and Mexico — will shrink in 2009, with another 4 posting no growth.” Instead, investors are using low prices and a lull in bad news – rather than a change in economic tenor – as a basis for buying. Of course, the bulls will selectively point to data which paint a different picture. “From monetary easing to joint fiscal policy to capital becoming less constrained at banks, the potential for a recovery in 2010 and 2011 seems more likely.” Some analysts have argued that they believe emerging markets have been, and will continued to be cushioned from the worst of the financial crisis due to their conservative financial sectors, but this argument strikes me as self-justification. 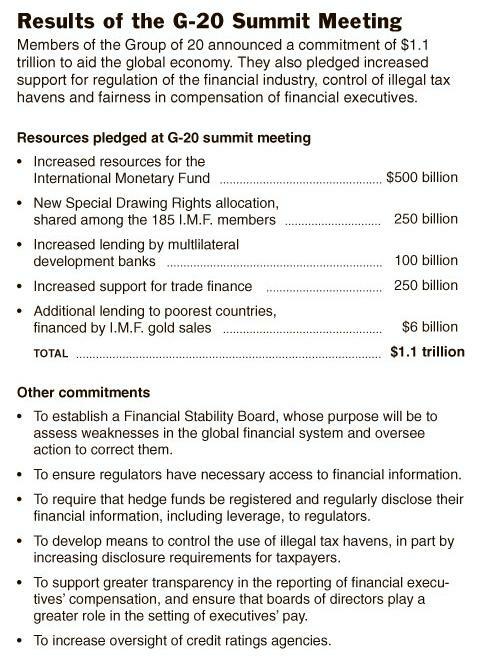 Others point to the $500 Billion increase in capital that the IMF (via the G20) will potentially make available to developing countries. As I wrote in a recent post, however, much of the perceived increase is redundant and/or has not yet been guaranteed by rich countries. Personally, I fall in the “cautiously pessimistic” camp, summarized as follows: “The economic picture is cloudy enough that a number of investors say it is worth adopting a more nimble approach in the short run.” In other words, a wait-and-see approach is probably more prudent than following the crowd, especially since it was the crowd that as originally responsible for the bubble. This week, the Yen continued its decline against the Dollar and Euro, dipping well below 100 Yen/Dollar en route to a six-month low. Most analysts attribute this trend to a pickup in risk aversion: “Some kind of optimism is returning to the market and that’s putting pressure on the yen,” explained one analyst succinctly. The government is finally responding to the economic crisis, having most recently unveiled a $150 Billion plan, to supplement the $100 Billion initiative announced earlier this year. “If implemented competently, these steps could stabilize the domestic economy and stop the bleeding in labor markets.” At the same time, the intertwined tailspin in confidence and spending suggest that the government’s efforts could be in vain. While equity investors have reacted positively – pushing the stock market into positive territory for the year- bond and currency traders are understandably concerned. Yields on Japanese bonds are already rising in anticipation of $100 Billion in bonds that the government will have to issue in 2009 alone. Naturally, the burden to purchase these bonds will fall on the Bank of Japan, which will be forced to print money and contribute to the further devaluation of the Yen in the process. Ultimately, the duration of the Yen’s slide depends on the duration of the global stock market rally. 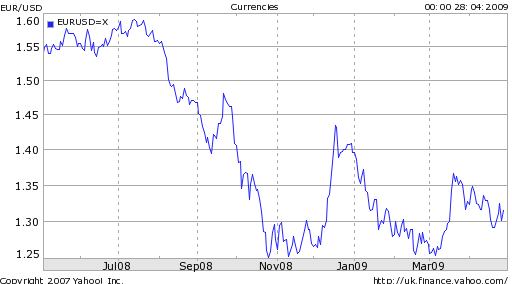 If you believe that the global economy has turned a corner, then the Yen is done. If, on the other hand, you are inclined to side with George Soros, who opined recently that “It’s a bear-market rally because we have not yet turned the economy around,” then there is still cause for Yen bullishness. The sudden rise to popularity of SDRs (in spite of their 40 year history) can be attributed both to developing countries’ growing unease about the status of the Dollar, as well as to their perceived usefulness as a tool in fending off economic depression. Ignoring the latter- for the purpose of this post- let’s look, at how SDRs will impact the role of the Dollar as the world’s reserve currency. In addition, it’s not clear what benefits the synthetic currency would yield. Asks one commentator: “What is one to tie it to?…in a world of depleting resources it is difficult to fathom how to create a list of constituents which would not constrain global growth and tie us into many years of deflation.” In other words, given that the SDRs will derive their value from underlying currencies, it doesn’t seem like the end result would be anymore stable than the current system. Yesterday, the European Central Bank delivered a surprise to the forex markets; instead of cutting rates by the consensus expectation of 50 basis points, the ECB knocked down its benchmark lending rate by only .25%. The Bank also opted against certain non-standard measures that would accompany a change in monetary policy. At this point, all investors can do is wait until the next meeting to see if the ECB will finally intervene in credit markets as well as on behalf of beleaguered Eastern European currencies. There are a few explanations. First of all, it’s possible that the ECB is selectively interpreting data as a basis for deriving a more optimistic economic forecast. Given the spate of recent bad news emanating from Europe, however, this seems unlikely. Besides, no less than Trichet himself has suggested that an economic recovery is unlikely to occur before 2010. There is also the possibility that the ECB is simply prioritizing its mandate to guard against inflation, rather than to stimulate economic growth. This theory is also unconvincing, given that price inflation has already fallen well below the ECB’s target of 2%. Perhaps, the best explanation is technical: “A 50 basis point cut would have required the ECB to cut the interest that it pays on deposits by banks to zero, from 0.5%, in order to maintain the current spread between the two of 1 percentage point.” Along the same lines, “European interest rates are lower than those in the U.S. when making a comparison of real inter-bank lending.” Ultimately, it’s probably the Bank’s conservatism that is behind both its comparatively tight monetary policy and its failure to unveil a quantitative easing plan that would mirror those put forth by the Fed and Bank of England. In other words, the door for more drastic monetary prescriptions has been strategically left open in the EU, while all but closed in the US and UK. 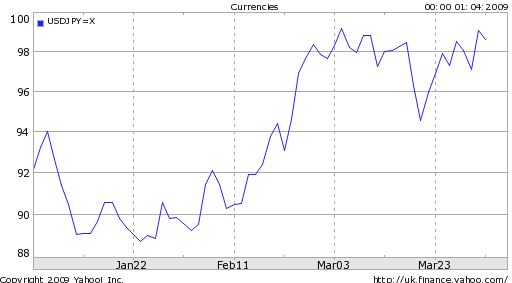 Curiously, the “the smaller-than-expected rate cut ‘remains an all-round booster for the single currency.’ ” Prevailing trading patterns and market sentiment seemed to herald a decline in the Euro, as investors have recently prioritized capital preservation and vigilance against deflation. Based on the positive market response, however, we can conclude that there are still some traders for whom interest rate differentials are important. After all, the only remaining alternatives to the EU (from the standpoint of yield) are Australia and New Zealand, but both of these economies/currencies are perceived as risky. This week marked a couple milestones for the Japanese Yen. 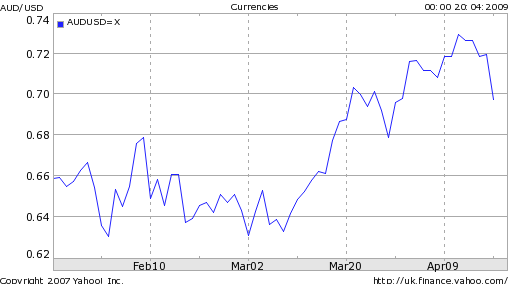 First, the Yen fell below 100 JPY/USD for the first time in five months. Second, the Central Bank of Japan “celebrated” five years of not having intervened in forex markets. Of course, the relationship between these two events is not difficult to ascertain; as the Yen retreats from the stratospheric highs of 2008, intervention is becoming progressively less necessary (and hence less likely). Risk aversion, or in this case a decline thereof, has been identified as the likely cause of Yen weakness, although as I alluded in an earlier post, there is still a question of causation, as opposed to correlation. Is it higher equity and commodity prices that are driving risk tolerance, or the other way around? Regardless of whether the chicken or the egg comes first, higher asset prices have recently been accompanied by modest declines in so-called “safe haven currencies,” namely the Dollar and the Yen. In the case of the Yen, there were previously two different narratives, one that underlies the Yen’s performance solely against the Dollar, and another thread seems to govern its fluctuations against virtually all other currencies. Having appealed unsuccessfully to the G20 to create a viable reserve currency, China is now taking matters into its own hands, by pushing the Chinese Yuan as a viable alternative. Earlier this week, it signed a $10 Billion+ swap agreement with Argentina, involving an exchange of Argentine pesos for RMB. The agreement is ostensibly designed to benefit Argentina, whose economy has been hit hard from the global credit crisis: “The peso has been weakening slowly but consistently since mid-2008, when a major farm strike here spooked investors and led many Argentines to trade in their pesos for dollars.” By guaranteeing a large quantity of RMB – which is generally considered undervalued- China is effectively providing the peso with more solid backing. In actuality, the swap was probably proposed by China in order to demonstrate its sincerity in seeing the Dollar replaced as reserve currency. Especially among developing countries and/or Asian countries, many of which represent major trading partners, China is keen to increase the supply of Yuan. One analyst wrote that ” ‘We expect more agreements with other emerging market countries will be in the pipeline,’ as the swaps will help ‘Chinese slumping exports by making access to finance easier.’ ” Accordingly, the swap agreement with Argentina represented the sixth bilateral currency agreement signed by China in recent months. The other five countries are Belarus, South Korea, Hong Kong, Malaysia, and Indonesia, with the total nominal swap value of nearly $100Billion ($650 Billion RMB). China is also moving to make the Yuan fully convertible, such that it can be exchanged freely both inside and outside China. It is intended that Chinese banks and exporters, for example, will now be able to accept payment directly in foreign currencies, rather than first being forced to convert them into RMB. In addition, the government “will triple the amount of domestic securities that overseas funds can buy under the qualified foreign institutional investors program to $30 billion” in order to make it easier for foreigners to invest directly in China. While the moves announced so far are too small to make any meaningful waves in the forex world, investors seem generally supportive of China’s efforts. Remember that only two years ago, hedge fund manager Jim Rogers famously announced that the RMB was due to appreciate 500% over the next couple decades and subsequently moved much of his personal savings into RMB-denominated bank accounts. « Is Gold a Hedge Against Inflation and Currency Weakness?